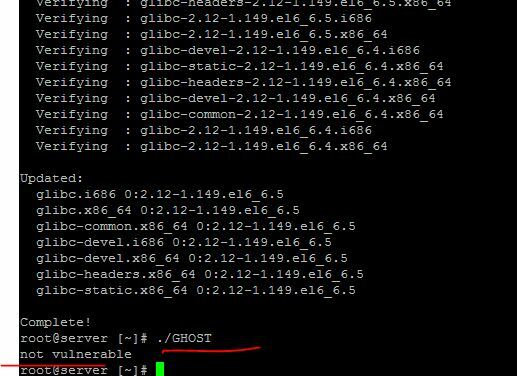 The GHOST vulnerability is a serious weakness in the Linux glibc library. It might allows attackers to remotely take complete control of the victim system without having any prior knowledge of system credentials. CVE-2015-0235 has been assigned to this issue. Once execute, the output will clearly state(“Vulnerable” or “Not Vulnerable”) if your server is affected by the vulnerability. If your server is found vulnerable, then run the following command as root on your respective distribution. After again try the GHOST to check the same. Qualys security researchers discovered this bug and worked closely with Linux distribution vendors. And as a result of that we are releasing this advisory today as a co-ordinated effort, and patches for all distribution are available January 27, 2015. The best way to mitigate the risk is to apply a patch from your Linux vendor. Qualys has worked closely with Linux distribution vendors and patches are available as of today January 27, 2015. Why is it called the GHOST vulnerability? It is called as the GHOST vulnerability as it can be triggered by the GetHOST functions. No. This is an implementation problem in the affected versions of the software. What versions and operating systems are affected? The first vulnerable version of the GNU C Library affected by this is glibc-2.2, released on November 10, 2000. We identified a number of factors that mitigate the impact of this bug. In particular, we discovered that it was fixed on May 21, 2013 (between the releases of glibc-2.17 and glibc-2.18). Unfortunately, it was not recognized as a security threat; as a result, most stable and long-term-support distributions were left exposed including Debian 7 (wheezy), Red Hat Enterprise Linux 6 & 7, CentOS 6 & 7, Ubuntu 12.04, for example. Where can I download the exploit? We want to give everyone enough time to patch. According to our data once the vulnerability has reached its half-life we will release the exploit. Half-life is the time interval measuring a reduction of a vulnerability’s occurrence by half. Over time, this metric shows how successful efforts have been to eradicate vulnerability. A shorter half-life indicates faster remediation. Half-life was originally coined by Qualys in the Laws of Vulnerability.